Mediacart is carefully testing and slowly launching the next generation shopping cart, with a healthy respect for the brutal environment it will enter: the grocery store and the parking lot. The ruggedized video display (no audio) will show no more advertising than the company has verified can be absorbed by most shoppers. They realize they have to improve the overall shopping experience. 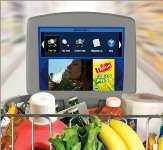 One of the company's findings: 87% of the 150 shoppers surveyed said they would choose a retailer equipped with Mediacart over one without the carts. The reason: "They enabled them to get out of the store more quickly," Mr. Kramer said, because an on-screen navigation tool allowed them to find the aisles where, say, anchovies, ketchup or razors were stocked. I just got a glimpse of the future. 1to1 Media sent me an email "preview" about their print magazine which is supposed to arrive in my mail box in a few days. Now, I'm sure they are not the first magazine to do this, but this is the first time I've noticed. The cover story was available for me to read immediately, but there were few other live links in the email, except the ones from their advertisers. I expect that the preview email will be a commonplace tactic for magazines who want to keep their audience engaged. By the way, 1to1 Media also sends as email version of the monthly magazine as well. About Us - 1to1 Media. 1to1 Media is dedicated to helping organizations realize the greatest value from their customer base. We provide resources that deliver current and relevant information on the latest thought leadership regarding customer strategy and marketplace trends. Our goal is to serve as the catalyst that will inspire senior executives to drive change within their organizations, making customer-based initiatives the centerpiece of their growth strategy and competitive advantage. When the internet media company Flavorpill got together with Anheuser-Busch, they didn't just place Budweiser Select ads on the sites or in the email newsletters which go out to hip urbanites looking for the coolest music and art shows. Instead, Anheuser-Busch funded the work of several artists to decorate the site and emails with beautiful images that contain understated references to the Budweiser Select logo. You can see all the artwork at www.flavorpill.com/select. BusinessWeek Jon Fine says that it's unusual for a media outlet to produce ads for a marketers, but newspapers create ads for their local clients all the time. What's really amazing is the breath-taking quality of the artwork. Were the artists happy to use the logo in exchange for exposure? Flavorpill co-founder Sascha Lewis got his audience involved, too. Now they are voting on which artist should have their work for Select translated onto billboards. This project is more than a "blurring of the line between media and agency." It's an amazing collaboration that benefits the players in every direction. "One of the goals," says Lewis, is "to create as close as possible a seamless relationship between the media partner, aka the advertiser, and our content and our product." The Web "has created a [more] collaborative effort between the media vehicle and the creative content...than any medium in the past," says Tony Ponturo, vice-president of global media and sports marketing for Anheuser-Busch. The limitations of viral marketing are starting to be recognized by some of the technology companies who've been on the band wagon. So, of course they need a new piece of jargon: contagiousness. In the same issue, Alice LaPlante also has a good interview with the people at Sun Microsystems about what they've done to attract more members to their online communities. To get consumers, as opposed to developers, more involved with promoting Java, they set up a web site where all the games and utilities which use Java can be showcased. Golf Solitaire, for instance. "Contagiousness takes viral marketing a step further by paying attention to the conversations between people, nurturing them, and using them to develop collaborative communities," says Perry Klebahn, a consulting professor at Stanford who was formerly the head of sales and marketing at retailer Patagonia. Rather than being the flash-in-the-pan that most viral campaigns are, contagious conversations "significantly affect the general customer experience over the long term," he says. 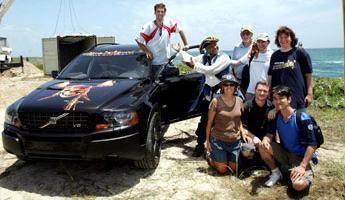 Many marketers run a contest, award the prize and move on, but Volvo has done a good job of maintaining audience involvement in the treasure hunt promotion they created in conjunction with the Pirates of the Caribbean movie. There's new material when you return to the web site, and plenty of explanation for newcomers who missed the boat but still want to know what happened. Right now they are posting videos taken during the final stages of the contest. They used many good storytelling techniques to keep non-players entertained. The webisodes were produced in the tradition of such popular reality shows as Survivor and Amazing Race, and were filmed by individuals who have worked on reality shows such as Fear Factor..., and will be available online for the coming months. Visitors to the Habbo Hotel (mostly young teenagers) don't pay to enter, but the economic model requires that users become sufficiently engaged to buy both low-cost items and access to paid areas to improve their experience. The marketers at Habbo have been very inventive in finding ways to get teens to try out the purchasing experience and making sure their parents are happy with it, too. Marketing Sherpa interviewed the marketing team at Sulake, based in Finland. They used the scratch cards at promotional events to distribute coins to give teens a taste of what they could do in the Habbo Hotel, like iTunes giving away a song. Habbo recently tested a $10 prepaid card with CVS. The card had to be swiped at the cash register to activate... “we set a limit purposely on every payment method, anywhere from $20 to $30 per payment method.” .... Habbo quickly reacted to any problems with parents upset over their children charging payments without their permission, offering partial refunds and banning teens from the site for periods of time. Despite my focus on communications, I frequently find myself talking about the retail environment. So when I was reading this article, the trend suddenly became crystal clear. Apple, Nike, adidas and all the rest of these brands are now using stores as communication platforms where a lot more happens than purchasing. Even if you don't actually go to the store, you hear about the store and form an opinion about the brand. Spread over 5,700 square feet with two floors, this sports performance centre would act as an important platform for communication and to showcase the breadth and depth of its product offerings, said Andreas Gellner, managing director, Adidas India Marketing Private limited.